Winter is as good a time as any to Visit Scotland. You might not get the endless long days of spring and summer but it’s just as beautiful and heartwarming. And there is an advantage of visiting Scotland in the winter, accommodations are usually cheaper, there is lots going on in the cities and towns around Christmas and Hogmanay and it’s generally a great time to be here. When the weather is cold and wet there is warmth and cosiness to be found inside and often winter presents itself from its good side with crisp frosty days, some snow and fabulous light if you’re a photographer. You might even catch a glimpse of the Northern Lights. A ten day festival featuring St Andrew’s Day celebrations, markets, parades, fireworks, street entertainers, fairgrounds, family events, pipe bands, cèilidhs, whisky tasting, haggis tasting and so much more. Community torchlight procession through the streets of Glasgow’s west end to mark Scotland’s Patron Saint Day, with pipe bands, samba drummers and fire performers.Everyone is invited. Have a hoolie in St Andrews and celebrate Scotland’s National Day with cèilidh, fireworks, music, food, drink and much more. Fun packed Night at the Museum events with creative, inspirational and fun programmes, including music, talks, poetry, performances, object handling, and treasure trails. St Andrew’s Day ‘Scotland and the Culture of Comics’ will showcase the diversity of characters and storytelling, and provide opportunities for creating alternative worlds. Burns Night will celebrate ‘Pie, Pop and Play; Burns on Stage’, with an innovative children and family programme. An Lanntair’s Winter Festival events begin with a full week of activities to celebrate St Andrew’s day including cinema, food, drink and music of Scotland. The Burns weekend begins with a programme of music performed by The Neil Johnstone Quartet with the Nicolson Institute Girls’ Choir providing the songs in both Scots and Gaelic followed by an alternative Burns Supper. The following evening there will be a family friendly Scottish quiz night and a trad music session in An Lanntair’s bar and restaurant. 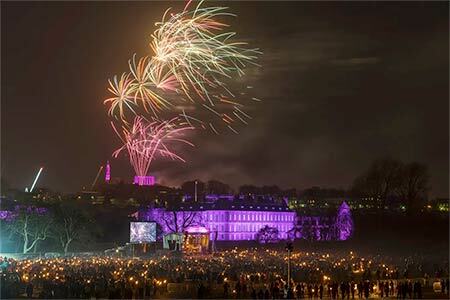 Marking Scotland’s Year of Young People 2018 coming to a close, Edinburgh’s Hogmanay officially gets underway with a celebration Scotland’s young citizens by giving them the limelight with the fiery finale of the popular Torchlight Procession (30 Dec) sharing their #ScotArt with the world. On the night itself (31 Dec), the Street Party will return bigger and better than ever with the Concert in the Gardens headlined by Franz Ferdinand. Bairns Afore will once again give children their midnight moment early on in the evening. There is something for everyone at this year’s Edinburgh’s Hogmanay including Ceilidh under the Castle, and Hogmanay HQ, an exclusive VIP party at The Hub. Kick 2019 off with a brisk dip in the chilly waters of the Firth of Forth with The Loony Dook or stay indoors in the beautiful surrounds of McEwan Hall for a series of concerts including the free First Footers Family Ceilidh and performances from Capercaillie and Carlos Nunez later that evening. Message from the Skies returns for 2019 and will run through to Burns Night, with a celebration of Scotland’s literature, in a co-commission with Edinburgh International Book Festival. After 80 years, the Stromness Yule Log is back! Revived for Stromness 200 last year, this old tradition returns for Hogmanay 2018.The Northenders and Soothenders will once again do battle. Split roughly along an old town boundary the teams will once again try and pull the yule log to their territory. This year, in support of the Year of Young People 2018, the event will include a Junior log pull, expanding the reincarnation of this traditional event to the towns youth. Bring in the bells at our open-air stage on Schoolhill with live music and a spectacular firework display from the roof of His Majesty’s Theatre. The Fireball Ceremony is Stonehaven’s unique way to welcome in the New Year and greet friends and neighbours. As the midnight chimes ring out on December 31st, approximately 40 men and women parade up and down the High Street swinging fiercely flaming balls around their heads. Bring in the New Year on Stirling Castle Esplanade with live music, food, friends and family under spectacular fireworks displays. There can be no better place to bring in the New Year with friends. Start your New Year with a magical 4km walk around the Helix, Home of the Kelpies. The park will be transformed into an extraordinary spectacle of fire performances, interactive light installations, breath-taking puppetry, enchanting sculptures, and animated projections depicting the zodiac signs. Find out what your future holds. Big Burns Supper is Scotland’s landmark Burns Night event which takes place in Dumfries and features a heady mixture of cabaret, comedy, music and entertainment in over 30 different venues as the town goes bonkers for 11 days of winter magic. From Unique Events, the team behind the critically acclaimed ‘Scot:Lands’ is a new festival called Burns & Beyond, celebrating the life and legacy of Robert Burns and bringing together the best and brightest of Scotland’s cultural landscape. This innovative new event will invite audiences to experience free and ticketed events from 22 – 27 January in venues throughout Edinburgh city centre, including the spectacular Museum of the Moon @ St Giles’ Cathedral, The Burns Supper and a brand new Culture Trail experience. Visit www.burnsandbeyond.com for programme and ticket information. Join in the celebrations of our national bard with an afternoon of art workshops, kirkyard tours, storytelling, performances and much more at the Burns House Museum. Suitable for all the family. Perth will celebrate the contribution Robert Burns has made to Scottish culture, with live entertainment and fun with a Scottish twist as part of the Riverside Light Nights event. On the Saturday, there will also be a themed parade starting in Perth city centre, and heading over the bridge to bring participants to the venue. Celebrate the bard in his ‘hame toun’ with a celebration street party, the world’s first Burns Supper drive thru, Burns live music nights, Alloway birthday celebrations, the only Burns Supper in the world to take place in Burns Cottage, the winner of the Robert Burns Humanitarian Award and much more!